The Christmas Market – Wow thank you Everybody!!! If you came to the Christmas Market and The Magical Grotto on Saturday you will know that it was quite an event, and we were very, very lucky with glorious sunshine for the whole day. We would like to say a huge thank you to our nearly 100 volunteers, they pulled out all the stops this year. There was more things to do and stalls than we have ever had and it’s thanks to them this can happen. With a ride, lots of external stalls, the fabulous mini-steam engine, Mr & Mrs Christmas, a Fairy Godmother with her Prince Charming, beautiful flowers by NAFAs there was so much to see and do. Thank you to every single person who attended or supported the event, it was so lovely to have all the additional stalls attend this year creating a real market feel. To have so many people of all ages, abilities and our four-legged friends together enjoying the day is worth all the hard work that goes into a community event like this. Thank you to all of the organisations and Councils who supported this event. The public support to help a local standalone charity for adults with learning disabilities is overwhelming, this support is vital in ensuring ‘life is for living’ for all who use the facilities at Acorn Village. Before costs the event has made just over £10,000, an incredible amount and all of which will go straight back into supporting adults with learning disabilities. Incredible flower displays by the NAFAS volunteers. A huge thank you to them all! Fitsteps showed us all how get fit through dancing, Mickey & Minnie joined in with their routine!! The constant reminder of how all the money raised will be spent ensuring ‘Life is for Living’ for all adults with learning disabilities who live or use the facilities at Acorn Village. 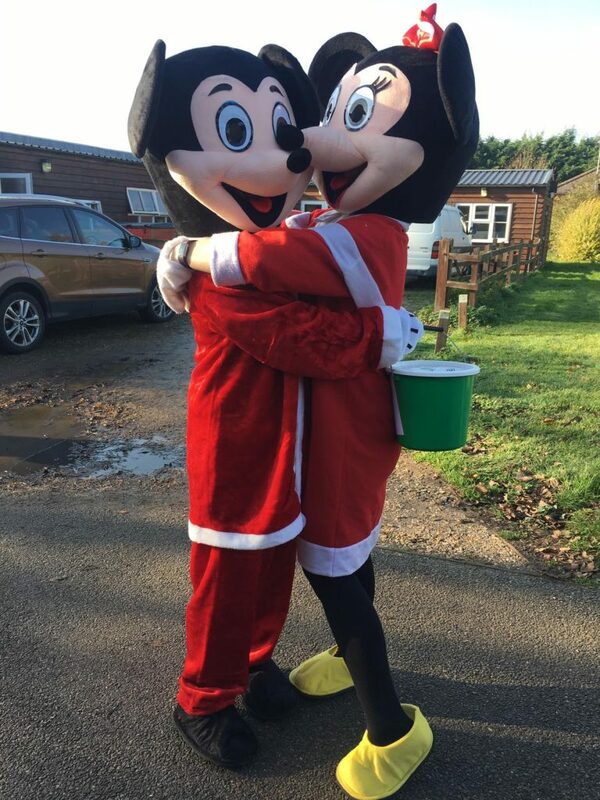 The public support was so overwhelming for our Mickey & Minnie they had to have a celebratory hug! Smiles all round for our residents helping out on the stalls. For the first time ever, there was a ride at Acorn Village and it was very popular!! Supporting everyone in the community, our wonderful local fire crew. They were a huge attraction until they had to go and save lives on a call out. A huge thank you to them for their continuous support, Mickey & Minnie were big fans of theirs. An incredible display of items for sale from the Acorn Artists. With these smiles, there was no surprise everyone headed to the bottle tombola!! Well done Team Acorn! A huge thank you to the Fairy Godmother & her Prince Charming for giving up their day to support adults with learning disabilities. Volunteers rustled up some amazing treats this year, our first ever BBQ at Christmas, Mulled Wine and these Festive Hot Chocolates. This took a lot of the pressure off of the Coffee Shop, thank you so much to them! We couldn’t believe that the real Mr & Mrs Christmas gave up their time to come to Acorn Village bringing with them their hard working elves. Thank you to the whole Grotto Team, they were amazing. We love the miniature Steam Engine and are so grateful to them for giving up their time to bring this incredible engine for us all to enjoy! Debbie Millar School or Dance did it again this year with an even bigger and better performance than last year, so talented and such a highlight of the day. Thank you to them all! Having our four-legged friends on the day delighted some of our residents, with Mickey Mouse and Greyhounds, life couldn’t get any better!! Another first was the Santa’s Grot-Oh….. where those who were feeling bah humbug could delight in the grumpiness of these pair (they were just about able to smile for the camera!!). Something for everyone, arts and crafts were available with our Creative Craft Centre Staff to take home a memento of their day! The car parking Turkey…. no wonder there was so many smiley people around on the day!! From all of us at Acorn Village, a very big THANK YOU!